I want to thank you for creating TheissCare so that I could find my way there, to get my self to a healthy life style. Since the beginning I have been so impressed with your care and concern about my health. It’s been a great experience for me and so many wonderful things have happened in my life in these past weeks. First and foremost I am so grateful to not be taking blood pressure medication anymore, which I have taken for 15 years. Its hard to believe that the first day I came to you my blood pressure was 180/97 and that was with medication and now I am no longer taking blood pressure medication. I never ever imagined that it would be possible for that to happen, but happen it did. It is hard to describe the energy I have now and what a joy it is in my life. 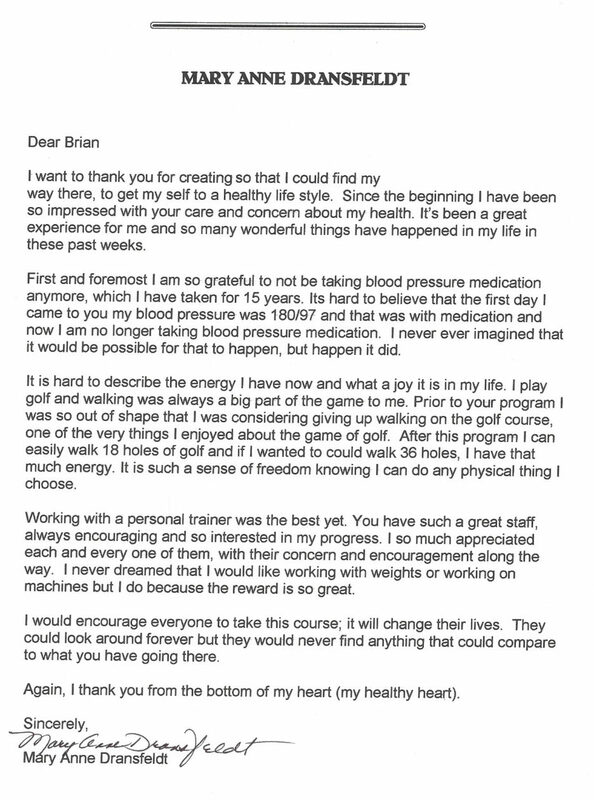 I play golf and walking was always a big part of the game to me. 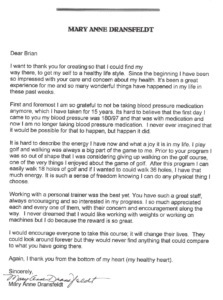 Prior to your training program I was so out of shape that I was considering giving up walking on the golf course, one of the very things I enjoyed about the game of golf. After this program I can easily walk 18 holes of golf and if I wanted to could walk 36 holes, I have that much energy. It is such a sense of freedom knowing I can do any physical thing I choose. Working with a personal trainer was the best yet. You have such a great staff, always encouraging and so interested in my progress. I so much appreciated each and every one of them, with their concern and encouragement along the way. I never dreamed that I would like working with weights or working on machines but I do because the reward is so great. I would encourage everyone to take this course; it will change their lives. They could look around forever but they would never find anything that could compare to what you have going there. Again, I thank you from the bottom of my heart (my healthy heart).